It is no fun to get stuck in traffic jams twice a day. The average travel time to work in the United States is 25.4 minutes, according to the U.S. Census Bureau. The Costa Rican Census Bureau can’t deliver numbers on that. We’d probably be surprised at the outcome. I know a family where the mom, dad and two kids each has a car. That is because they each have a reasonable income and good credit, so they can afford it. Although they live in the same house, they all work in different locations in the Central Valley. They are looking to buy a house that is located in the center of the four workplaces. Right now, the four of them spend 60 hours a week on the road to get to work and home again. Crazy? Yes it is. 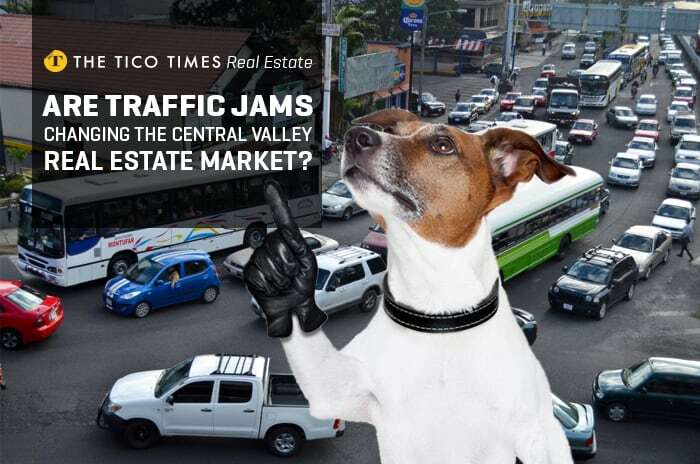 How much is commuting in the Central Valley becoming an issue? Instead of spending so much precious time in traffic jams, I think a change in the market is imminent. Soon more families will try to relocate to a better location closer to their workplace. Commuting has a huge cost to society — in car payments, gasoline, tires, tolls and mostly on the nerves. A lot of people can’t stand it anymore. Therefore, change is coming. Our office already receives requests from families who moved to Ciudad Colón some years ago, because it was so nice and quiet. Now, they spend hours on the road to get the kids to school in Escazú and then get to work. And pick up the kids on time from school, drop them off at home, and back to work again. Crazy? Yes it is. A while ago, I was interviewing people for a job in my real estate office in Escazú. I received over 200 résumés. But those that were interested in the job lived in Cartago, Alajuela and Heredia. That’s a 1½- to 2-hour commute. I couldn’t find anybody in Escazú or Santa Ana, though I really tried. I ended up hiring Shirley, who now does a 3-hour daily commute, five days a week. Crazy? Yes it is. In 1982, my first wife was working at the headquarters of a large soda drink producer in La Uruca. La Uruca is an industrial/commercial area northwest of San Jose. I remember the company carpenter living right next door. His colleagues would comment that they would never want to live right next to the office. But deep in their hearts, they would have loved to be in his shoes. The man was the only one not eating lunch out of a lunchbox. In those times, you could drive from Escazú to Cartago in a little over 30 minutes. There were no traffic jams and in Costa Rica, we were not used to spending much time on the commute — quite the contrary to other countries. Traffic jams will never diminish in Costa Rica. Even with the best intentions, the government will not have the money to build the much-needed infrastructure. The middle class is already accepting its fate of a long commute every day to get to work. It is what it is and as long as the Costa Rican government doesn’t find a solution in public transport, the middle class will just have to live with it. Nevertheless, there are a large number of upper-middle class workers who can afford to move closer to their jobs. Unfortunately, Costa Rica doesn’t have any well-organized multiple listing service, where you could see everything that is for sale in each neighborhood. With an MLS in place, we might even see some people swapping houses in the future. Real estate developers will have to find more central locations closer to the workplace, and that might help lessen the traffic jams. Virtual jobs are becoming more available now. But with bad internet connections in many homes, this is not always possible. In some countries employers try paying employees to live closer to the office but I doubt that will happen in Costa Rica. I honestly doubt employers in Costa Rica care much about their employees wasting so much time and energy to commute. I suspect that will soon have to change. Commuting wears people out and is a detriment to anybody’s job performance. The older suburbs are becoming fashionable again and I suspect we’ll see an increased demand for some centrally located areas in the future. Locations like Tibas, Sabana, Guadalupe, San Francisco de dos Ríos and Barrio Dent will stage a comeback. Many homes and apartments in the older suburbs are starting to become interesting again. That, of course, doesn’t mean that sellers will be able to ask outrageous prices for their 50-year-old homes. Can real estate investors take advantage of this and take part in this urban renaissance? Yes they can! Not everyone wants to live in a condo. Buying and rehabbing older houses can be profitable if purchased at the right price.